Claver T. Kamau-Imani leads a house church in Houston, Texas and he is an emerging conservative influence who works to induct Christian people of color into the Republican party. He calls his mission “leading the second emancipation“. Claver broadcasts from KCHN radio, 1450 AM studios on Saturdays at noon. 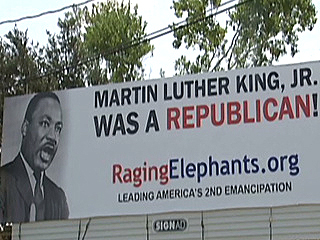 His “Martin Luther King Was A Republican” billboards draw a lot of attention in the Houston/Harris County area where his organization http://ragingelephants.org is working across Texas and America to strengthen the conservative movement. His eloquent, empassioned, intelligent presentation communitcates conservative ideas very effectively. Not finding a reliable on-line biography of Dr. King, I cobble together my own thoughts about this very important martyr for freedom. Liberals claim him for his dependence on government to solve problems and conservatives claim him for his core beliefs. Regarding his dependence on federal government for resolution of societal ills, I offer these first-hand observations. Pastor Broden shepherds the Fair Park Bible Fellowship Church in Dallas, Texas and head of the Black Prolife movement. His command of facts, his knowledge of history and his oratory skills uniquely qualify him as a major leader in the contemporary conservative movement. Experience examples of his leadership from these videos recorded at his church on September 11, 2009 and when he spoke at the September 12, 2009 Fort Worth 912 Project rally in Fort Worth, Texas. Stephen works to equip, educate and activate Americans to protect, defend and preserve the greatest nation on the face of the earth from the agenda of Marxists, socialists and “Darwin atheists”. Most recently, Kevin travelled with the TEA Party Express to motivate American patriots across the country. Mother heroically raised her three children under very difficult circumstances. A very successful business woman, father bankrupted her through sales of her properties and breaking her spirit. Yet, though not a confirmed Christian until two weeks before her death, she lived a principled life and imparted those principles to me. In my pre-integration hometown of Palacios, Texas, blacks did not enter the front door of a white-owned home. Segregated facilities, if any, isolated black Americans practically everywhere: restaurants, public restrooms, neighborhoods and public schools. However, mother insisted black guests enter through the front door. She did not believe in “separate but equal”; she believed blacks and whites were “separate and unequal”. In 1963, while riding a New Orleans city bus with my older sister, an elderly black woman boarded our bus and I saw there was no available seat for her. I quickly jumped up and offered my seat to her. Her horrified look and immediate refusal surprised me. My sister hissed, “Sit down, sit down.” (Footnote: it was her custom to not explain her demands.) Confused, I returned to my seat. Later, sister explained the law: blacks could not share seats with whites on public transportation. A few years later, while enrolled in NATTC Memphis (Naval technical training), I witnessed the “garbage strikes”, civil unrest and civil rights march through Memphis. I departed the day following the murder of Dr. King. Our (Palacios, Texas) schools integrated in 1964. Older people warned us of all the evils we could expect to experience at the hands of blacks. Au contraire, we developed friendships and Jerry Hanes, an incredible running back, took us undefeated to 1964 UIL AA state football championship. It was all good, nothing bad. He relied on the federal government, because state governments failed him. Dr. King, like the freedmen who voted in the first two national polls following the Civil War (1866, 1868), was a Republican. Although he accepted an award from Planned Parenthood in 1966, I believe he did not understand the history and goals of Margaret Sanger. Remarks of Dr. King’s niece, Dr. Alveda King, August 23, 2007 – article from New York State Right to Life Committee, Inc.
Abolitionists inherently believe in the most fundamental of all rights – the Right to Life. Dr. King trusted first in God, second on the Constitution. He knew beyond all doubt that justice would prevail and the day would come when blacks participate equally of the opportunities and benefits of American citizenship. For the above, I recognize Dr. Martin Luther King, Jr. as one of the greatest American conservatives of all time. Star Parker should have her own show on Fox news, I believe it would have a double impact being both black and a woman. I believe the African Americans would watch and really find out that liberals are not their friends but in actuality their oppressors. At present, I doubt that hardly any African Americans really pay any attention to Glen Beck who they believe is a white racist.